Solidarity on Tap is a simple interfaith intergenerational gathering for socializing and social justice. 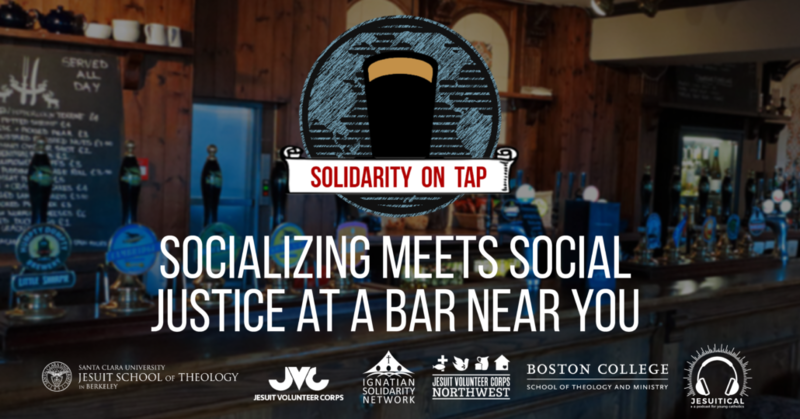 The Ignatian Solidarity Network, Jesuit Volunteer Corps, Jesuit Volunteer Corps Northwest, Jesuit School of Theology of Santa Clara University, Boston College School of Theology and Ministry, Jesuitical and local partners welcome all to Solidarity on Tap | Raleigh. Beverages (alcoholic and non-alcoholic) will be available for purchase. All are welcome (including people under 21). Aaron Dawson is the Workplace Development Manager for The Industrial Commons where he leads efforts to create and sustain worker committees in manufacturing plants that are interested in shifting to a more democratic and millennial-friendly culture. He has 15 years of experience as a worker-owner at Equal Exchange, a Fair Trade Massachusetts company specializing in the sourcing and distribution of coffee, tea, and chocolate. For ten of those years, Aaron held the role of Customer Service Manager, overseeing a team of 12. He has many years of experience participating in and facilitating worker committees and developing ideas, policies, and practices that create a positive and supportive work environment. In addition, he was selected to serve on Equal Exchange’s Board of Directors for six years and was Chair of the Board for one of those years. Aaron holds a Masters from St. Mary’s University in Halifax, Canada. He served on the Board of the US Federation of Worker Co-ops for four years and currently is Board Treasurer for the Democracy at Work Institute.